Climbing form. Pruning Group 11. Suitable for a wall, but not on a house wall as the climber can block guttering. 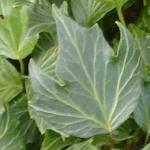 "An evergreen, self-supporting ivy with bold dark green leaves, the edges of which are beautifully rippled. 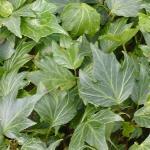 Hedera helix 'Green Ripple' is a tough, reliable and vigorous climber ideal for growing in sun or shade up a wall or fence." from Bluebell Arboretum & Nursery. "Ground cover - This term is generally used to refer to any plants which quickly cover the surface of the soil, suppressing weeds and helping to retain moisture in the soil. 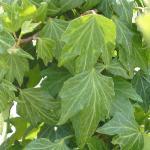 They are frequently also chosen for their ornamental properties. 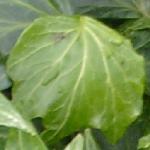 Ground cover plants are often low growing, although taller plants can equally provide ground cover. They can be evergreen or deciduous (since their weed suppressing and moisture retentive benefits are needed less over winter months). • Alchemilla mollis (Lady’s Mantle).
" from Oak Leaf Gardening.